UPDATED: Fri., Dec. 8, 2017, 8:05 p.m.
MEDFORD, Ore. – Rent hikes up to 40 percent at Mariposa Townhomes in Medford are just the tip of the iceberg as renters across the county find themselves priced out of their homes. “We get calls from several people a week who are losing their homes or will lose their homes,” said Jesse Sharpe, statewide organizer for Community Alliance of Tenants. Renters in the 101-unit Mariposa Apartments on State Street in east Medford face up to a 40 percent rent hike beginning next March, leaving elderly and low-income residents worried they will have nowhere to live. Sharpe said he’s seen rent increases in other apartment complexes or houses – including his own apartment – exceed 60 percent, but usually over several years rather than all at once. “My personal rent went up from $625 in the past four years, bringing it to $1,025,” said Sharpe, who lives in a two-bedroom apartment in Ashland. An immediate 40 percent increase is on the high side of normal, Sharpe said, but steep hikes have hit across the county over the past four years as available housing stock disappears. Sharpe and others are looking for ways to protect tenants from sharp rent hikes, frustrated that Oregon law currently has no protections in place. In the 2017 legislative session, House Bill 2004 sought to provide more safeguards for tenants, but the bill failed to muster enough votes in the Senate after clearing the House. To deal with Oregon’s rent laws, Portland passed a relocation ordinance that requires landlords who raise the rent 10 percent or more to pay relocation costs for tenants who would be adversely affected by the hikes. Sharpe said the ordinance has so far survived various court challenges. Sharpe said these and other ideas are being discussed with Medford City Councilmembers to provide some relief for tenants who can’t afford the rent hikes. “We have to look at more creative solutions,” he said. Sharpe noted the City Council is looking at investing $22 million in urban renewal dollars in the Liberty Park neighborhood just north of downtown. He said he would like to see the money spent to create affordable housing complexes in the neighborhood to help with the low-vacancy rate in this area. Jackson County, like much of the state, has few available apartments, leaving low-income residents with few options. Low vacancy rates have pushed up rents in every community from Ashland to Eagle Point for any non-subsidized housing. At Mariposa Townhomes, near Barnett Road, many renters don’t know where they will move because they can’t afford the hikes. “If they would just not raise it all at once or extend the time for us, it would be a big help,” said Donna Peters, a 63-year-old caregiver who works 30 hours a week. Her rent will jump from $615 to $875 next year, a 30 percent increase. Peters and three other residents of the apartment complex planned to plead their case to the City Council Thursday. “Something has to be done to keep the rents from going that high,” she said. The owner of the apartments, Ronald Deluca, has offered to reduce the rent increases for existing tenants by up to $50 and has offered to move some tenants into other, less-expensive apartments in the complex. Peters estimated that about 50 residents living in the complex probably can’t afford the new rent. Deluca stated on the CPM webpage that the buildings had a lot of deferred maintenance and needed significant upgrades. Monica Magdaleno, a 20-year-old Southern Oregon University student, said she and her roommate are spending $1,025 for a two-bedroom apartment in Ashland, but the apartment next door with the same floor plan is available for $150 more. “All my friends are struggling,” Magdaleno said. 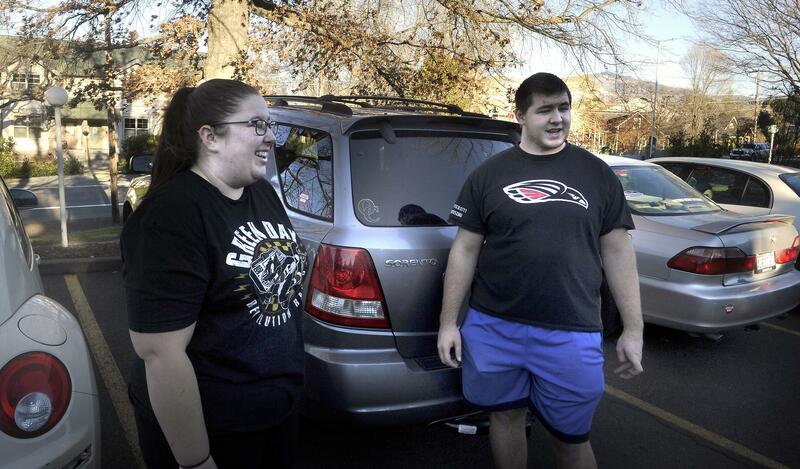 Some fellow students are commuting from Medford, where the rent is cheaper. Meanwhile, despite what she thinks is a high price for her apartment, Magdaleno said she’s had to endure an ongoing electrical problem with the water heater, a laundry facility that doesn’t work and slippery metal stairs that build up ice. “I just fell down the stairs,” she said. Mackenzie Civil and his fianci, Miranda Parrish, were living in the SOU dorms, but they said it costs $1,000 a month to live there. “The dorms are crazy,” 19-year-old Parrish said. They moved into an apartment on Siskiyou Boulevard with a roommate for $800, and the price jumped to $845 after the summer. With student loans to pay, the couple looked high and low for a cheaper place near campus. Jason Elzy, executive director of the Jackson County Housing Authority, said the demand for affordable housing is overwhelming the supply. He said the housing his organization offers is maintained at a price based on median income. According to the U.S. Census Bureau, the median household income in Jackson County in 2015 was $40,028, and 19 percent of the county lives in poverty. “The area median income has remained fairly stagnant,” Elzy said. One of the unfortunate consequences of the low vacancy rate and high rents is that many can’t find another place to live after rental prices force them out, Elzy said. “The demand is so strong that families with limited means can find themselves homeless overnight,” he said. Published: Dec. 8, 2017, 2:20 p.m. Updated: Dec. 8, 2017, 8:05 p.m.